Nowadays mobile phones have become the integral part of our lives and when it comes to Android development or iOS development means when you are looking for an app creator then businesses get confused whether they should offer their users, mobile apps with attractive User Interface (UI) and amazing User Experience (UX) or apps which are compatible with multiple platforms and are faster to develop. Hence, React Native Development comes into the picture. React Native is an open source framework which can provide UI for both iOS and Android platforms. When you Hire React Native Developer certainly he can make this easier for you in animating the header titles. When we create our parallax headers in React Native then often we face difficult situation: using the Animated.interpolate() function to transition our styles between two Flexbox properties. We want to make our text transition from flex-start to center but it is not that easy to implement. When we look at the documentation for Animated, we come to know that while interpolate accepts strings for values but it is limited to colors and values with units. Actually we have to get creative with the Animated API in order to replicate our Flexbox transition in some other way. Think about the animation which you want to do. Below are the steps to achieve it. We will utilize the onScroll event to trigger changes to our animation. There are many ways to set up your header based on your use case. We are giving our setup for this example. Below is the code and you will also get an explanation for the important parts which will help us animate our text. 1.flexDirection:’row’- It allows us to animate our text horizontally. 2.justifyContent:’center’- It allows us to control our text alignment. 3.paddingHorizontal - It gives us the exact width of the area where our title is provided. we want to explicitly define this value rather than setting it to 100%. You can note that our header styles contain justifyContent:’center’ - which will help us get things centered at the end of our animation. We store the width of our header title when it renders as by this we can push it left aligned by adding an invisible view directly to the right of it in our header. When we provide this view next to our text then our text is left-aligned. Now in this last step we just need to animate the width of our invisible view from its initial width down to zero at the conclusion of our animation and our text will be centered. You can also add any other animations which you like to your text, header etc. Finally, now you just need to wire up the onScroll listener in ScrollView and check the animation. It is done now. That’s the beauty of React Native. When you hire any app Development Company then make sure they have React Native developers so that you can build app which can run on any platform. 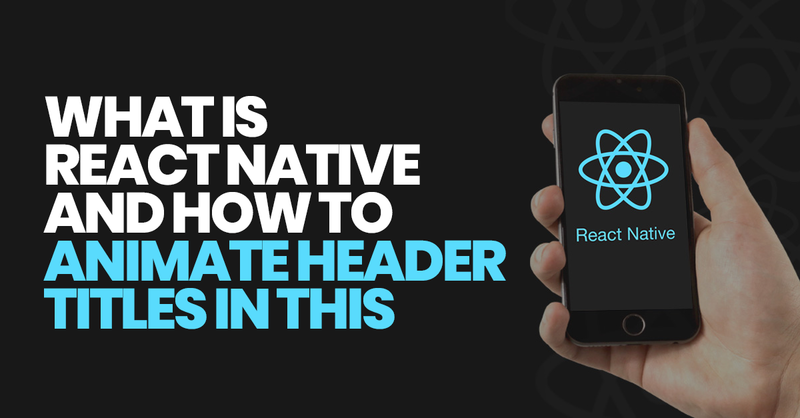 Comments on this post: What is React Native and How to Animate Header Titles in this?